Minimum order is 50 coolies. Pricing as low as $1.29 each. 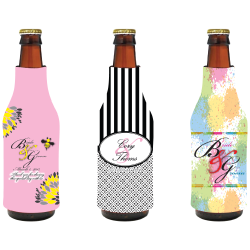 Our slip on bottle koozies come in full color! Why limit yourself to only 1 color ink, they can be printed in 2 colors, 3 colors or even in full color with your photos. You can decorate your print from edge to edge on this item with our designers that will help you create for no extra charge. Even with all of our help you still won’t be paying for any setup fees. Setup fees are overrated and we hate charging them! After your order is placed simply email us your artwork and we will get started. You always get an email proof before your order enters production so don’t worry - we will make it perfect. If its not perfect - we will change your proof and send you a new one. 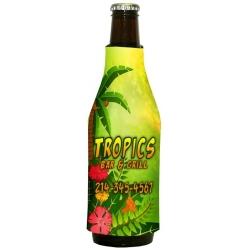 Stop thinking in 1 color, think full color bottle koozies! Size: Fits most types of 12oz longneck bottles. Order Info: Prices include a four-color process sublimation imprint on one or two sides.